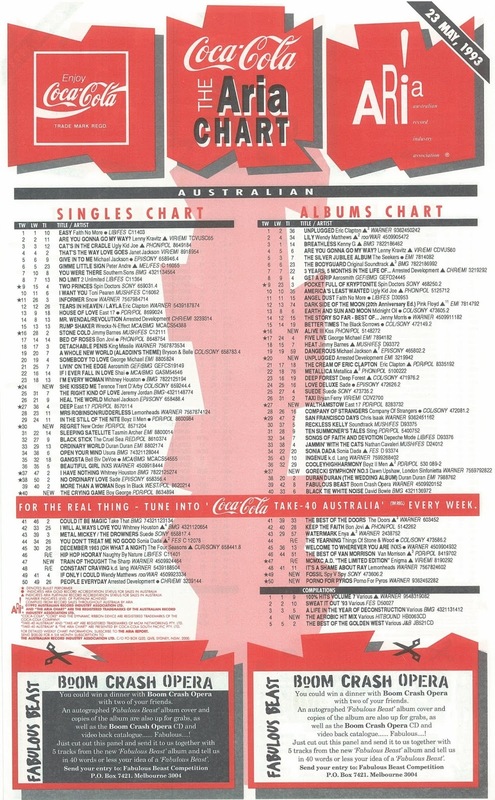 Everyone loves a comeback, and this week in 1993, three acts that had all been quite successful in the '80s returned to the ARIA top 50 for the first time in years. In two cases, the artists turned around their chart fortunes, scoring hits after a series of flops. In the third case, a band released their first new music in three years and their first studio album in four. Meanwhile, Faith No More spent their second and final week at number 1 with "Easy" before they'd be knocked off the top spot by another artist on the comeback trail. The biggest hit (a US and UK top 10) by the new jill swing trio became their first to register on the ARIA top 100. Debut single "I Wanna Love You" would follow later in the year. Ah, the musical megamix - so early '90s. I actually saw the production of Joseph And The Amazing Technicolor Dreamcoat starring the former Indecent Obsession singer and had the soundtrack album... but this is pretty terrible. One final top 100 appearance for the band whose biggest hit remained "The Love We Make". "Jackie" came out between flop singles "Chain Of Fools" (not a cover) and "If You're Going To Leave Tonight". They'd had an impressive run up until this point, with three top 15 hits to their name, but this latest single from 3 Years, 5 Months & 2 Days In The Life Of... was neither as big nor as good. Their brand of rockabilly had given them a top 30 hit in late 1992, and it was more of the same from turtleneck-loving trio The Sharp with their latest EP falling just short of the peak achieved by Spinosity. Naturally, a band as unique and quirky as The Sharp copped the inevitable sketch comedy piss-take, in this case from The Late Show. But would the send-up, er, derail their career as it had Frente's? Time would tell. The last time we'd seen Boy George in the top 50, it had been with his first solo single: his UK chart-topping cover of "Everything I Own", which made the ARIA top 5 in 1987. Since then, the Culture Club frontman had released four studio albums (including one as Jesus Loves You) and a string of singles, none of which had come anywhere near the top 50. Venturing away from his classic pop sound, he'd ventured into club-infleunced and modern R&B territory, with none of his output connecting locally. Not surprisingly, it was another remake which finally brought Boy George back to the chart. Released in late 1992 when the twist in the tail-featuring movie The Crying Game came out overseas, the singer's take on the 1964 single by Dave Berry finally took off locally once the film made it into Australian cinemas in March 1993. The Pet Shop Boys-produced theme sounded more like the type of white soul we'd come to expect from George during his mid-'80s heyday and reminded us all what a great singer he was. Even if it wasn't the biggest of hits, it was nice to see Boy George back in the top 40 for one last time. 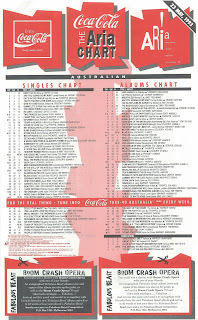 Three years earlier, their stand-alone World Cup single, "World In Motion", had narrowly missed the ARIA top 20 (and topped the UK chart), but it was even longer since New Order had released a new studio album, with "Fine Time" the only offering from Technique to make the top 50 locally (narrowly making the top 20 in 1989). Bursting back onto the scene with the effervescent (and more guitar-based than in a while) "Regret", the band were the proud owners of a new record deal with London Records after their previous label, Factory Records, disintegrated. The band's biggest ever hit in the US, "Regret" would end up being the only single from comeback album Republic to reach the ARIA top 50 and, in fact, its top 30 performance has not been bettered by anything they've released in the decades since, more's the pity. His debut album, Introducing The Hardline According To Terence Trent D'Arby, remains one of the best career-opening collections of all time - a global smash which topped the albums chart in Australia and the UK, and spawned four major hit singles. And then... nothing. More experimental follow-up album Neither Fish Nor Flesh was a commercial disaster and kind of unlistenable. In 1993, the artist now known legally as Sananda Maitreya returned with third album Symphony Or Damn, and Australia opted to kick proceedings off with "She Kissed Me" (while the UK went with "Do You Love Me Like You Say?" as lead single). Although a world away musically from the likes of "Sign Your Name" or "Wishing Well", the energetic, guitar-heavy "She Kissed Me" moved quickly into the top 10, reminding us all what a great vocalist Terence was. Once again, the return to favour was short-lived - despite releasing other good singles from the album, this would be TTD's final top 50 hit. Next week: Euro-dance triumphs over hoary old rock, plus the arrival of one of the most distinctively voiced performers of all time. Yesterday I found (and purchased, for $1) the compilation CD "Hit Machine '93" in my local op shop. The biggest hit on it is "Easy", the number 1 single from 25 years ago…and the rest of the songs on it are from this time period. Too bad nothing by The Sharp is on any of those compilations, as far as I know. I quite liked them. Pete, 'Train of Thought' is on 100% Hits Volume 8, and 'Scratch My Back' is on 100% Hits Volume 10. I can't remember if 'Talking Sly' is on Volume 7. I'm pretty sure 'Alone Like Me' was on one from '94, too, but I didn't buy it. Er, that should read 'Scratch My Back' is on 100% Hits Volume 9, not 10. Thanks Nathan, I didn't know that. I haven't tracked down 100% Hits Volumes 7-10 yet, but I'll keep a look out for them. I did see Volume 11 somewhere but passed it up — it had a Caligula song on it, but not "Tears Of A Clown". I should sell you mine ;-) After ripping them to .wav first. Volume 10 was the last '100% Hits' I bought (having bought volumes 2-10 inclusive, but not Volume 1). I opted for 'Hit Machine' in '94, as I thought it had better songs on it than the 100% Hits counterparts. I never heard the Jade song until hearing it via a 'The Greatest Hits of 1993' UK 2-CD compilation I picked up in Hong Kong towards the end of the year. The answering machine intro is the highlight for me; I don't care that much for the rest of the song. I don't recall hearing 'Jackie' before, though I must have. 'Chain of Fools' should have been a hit, as it's probably their best single, I think. I've heard 'Natural' before, but not since '93, and couldn't remember it at all. While it's not great, I like it more than the annoying 'People Everyday' and 'Mr. Wendal'. I love the "Ooh ooh!" chant in 'Train of Thought'. I remember being quite surprised/finding it slightly amusing that Boy George was back in the charts, when 'The Crying Game' crept into the rage top 60. It's a nice song, though, and produced well. 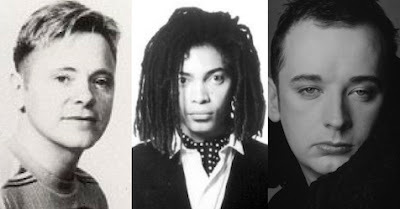 I like 'Regret', but prefer New Order's more sythesiser-based sound. 'She Kissed Me''s success was a bit unexpected; from me, anyway. Later singles from the album were better, I thought.